The Bell & Ross Vintage series has long been one of the more reliable sources of good-looking aviation watches made with an eye to the past. While this particular company was founded well after the original design eras its watches emulate so well, Bell & Ross has successfully captured the look and feel of early action watches while also giving them a slightly contemporary edge. This week we’re seeing a new twist, literally, as Bell & Ross adds the BR V2-93 GMT 24H. The newly rotating 24-hour bezel, a debut function within the Bell & Ross Vintage series, allows the wearer to find the time within three time zones. The earlier BR 123 GMT 24H offered a similar look but without the rotating steel bezel and black aluminum ring that really makes this new design sing. The bezel’s dual coloring (grey and black) – also a first for Bell & Ross – distinguishes between daytime and nighttime on the 24-hour scale. You’ll recall that just this past March Bell & Ross added an impressive new chronograph and a three-hander within the more specific Steel Heritage collection. But where those models emphasize their vintage look with sand-colored luminescent markers and hands, this new BR V2-93 GMT 24H dispenses with the creamy-sand color, hewing more closely to the stark white numerals and markers that make cockpit instruments more visible in dark surroundings. Still, the new watch’s 41mm steel case, black dial, rounded lugs, integrated crown protector and prominent 12, 3, 6 and 9 echo those Heritage models. And here, the brilliant orange arrow GMT hand, which Bell & Ross uses on its other GMT watches, is impossible to ignore. Bell & Ross has wisely offered the new BR V2-93 GMT 24H in two versions: One on a steel bracelet and one with a ‘tropical’ rubber strap. Prices: $3,200 (rubber strap) and $3,500 (steel bracelet). Movement: Automatic Caliber BR-CAL.303 (Based on ETA 2893-2). Functions: hours, minutes and central seconds. Second time zone with quick correction and independent hour hand. Date. Case: 41mm in diameter. Satin-polished steel. Bi-directional bezel with 24-hour scale. Grey and black two-color anodized aluminum disc. Screw-down crown and push buttons. Sapphire case-ack. Dial: Black. Numerals and indices coated in white Superluminova. 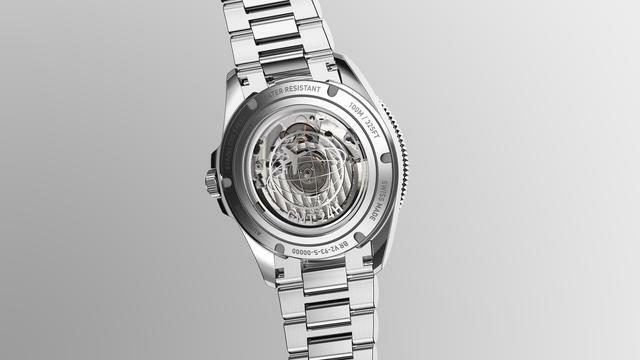 Metal skeletonized Superluminova-filled hour and minute hands. Buckle: Folding for metal bracelet, satin-polished steel pin for rubber strap.